Again, Kindle image size rules change. Not a whole lot, but the new outrageous Kindle image sizes become more understandable. I was reading a Kindle formatting guide, from Amazon, the other day which said full-width images needed to be 3000 pixels wide. This is not that bad. But not long ago, I received one of those dread quality notices from Amazon, in this case warning me of “low-resolution” images in one of my books. The images in question, of course, were far from low-resolution, but they did fall just shy of current recommendations of Amazon that are apparently now starting to be enforced. And I had to conform to those recommendations or risk having the book taken off sale. 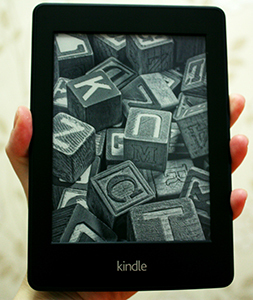 Here’s how Amazon figured it: First, they posited a standard display size of 4 x 6 inches for large tablets. (Note the 2:3 ratio, which my book recommends for full-page images, instead of the narrower shape in Amazon’s older advice.) Then they declared that an image that fills that area should display at a resolution of at least 300 pixels per inch, for a total of at least 1200 x 1800 pixels. It looks like Aaron’s problem is that he was trying to manipulate the HTML to force the images to be full-width. Not only is that an exercise in frustration, but you tend to call down the formatting police upon yourself. I released a new book over the weekend. It has five images in it (including the small cover I always include on page one). The images are all small—2-3 inches, with the largest being 5″x5″. After all the fonts are stripped out and replaced with Bookerly, the file size is still huge—2.3 MB. I decided to let D2D publish my book to Kindle. I’m tired of messing with it. They did what I’ve been recommending: All fonts are converted to Bookerly. The lists are converted to HTML lists. Supposedly there’s a new version of Kindle Previewer 3 that does tables better. I’ll believe that when I see it. Like you, I’m tired of Amazon’s image-resolution game and ticked off that they stick me with paying an inflated download fee when no one else charges such a fee. My next book doesn’t have images anyway, but in the future my Kindle versions won’t have images even if other versions do. I don’t which ticks me off more, Amazon or the passive way many authors respond to how Amazon treats them. They remind me of QuarkXPress in the 1990s. InDesign finally blew them out of the water. I wonder who is going to do it to Amazon?